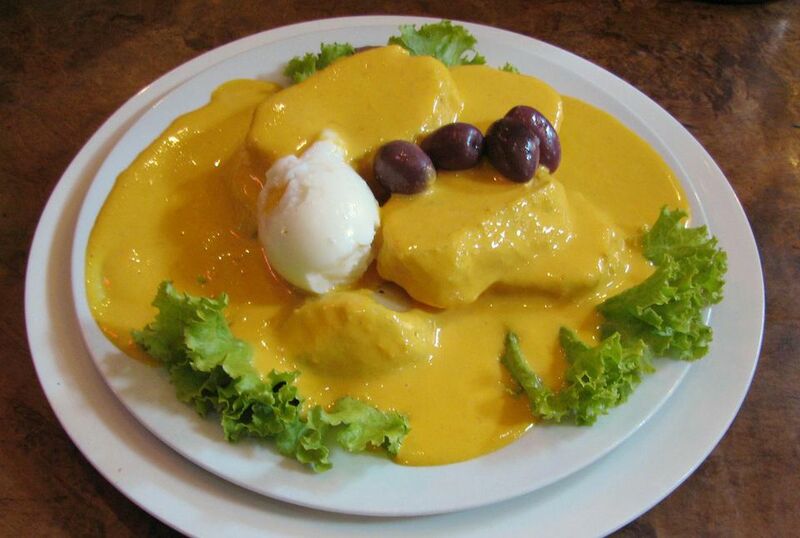 Papa a la Huancaína sounds exotic -- but it is simply boiled potatoes covered in a spicy cheese sauce. The dish originated in the Huancayo region of Peru. This potato dish is typically served cold as a first course or luncheon dish, but it also works as a side dish ​for dinner. It's delicious made with yellow or white potatoes. If you prefer a spicier sauce, add an extra yellow chili pepper -- aji amarillo. Heat a large pot of salted water to boiling and add the potatoes. Boil the potatoes until tender when pierced with a fork, about 15 to 20 minutes. Drain the water from potatoes and let them cool. Slice the potatoes and arrange on top of the lettuce leaves. Pour Huancaina sauce over the potatoes and garnish with slices of hard-boiled egg and black olive halves. Papa a la Huancaina is a rich, satisfying comfort food, much like macaroni and cheese in the United States -- but spicier and served cold. Serve it hot or cold as a main dish with a side of green salad, roasted Brussels sprouts, or steamed broccoli or green beans. Season the vegetables with garlic and chili powder, red pepper flakes or chili peppers to complement the potatoes. It also makes a delicious and filling side dish for a meat main dish. Cheesy sauce always pairs well with beef. Serve with broiled steak -- a cheaper cut like flatiron, flank, skirt or hanger might be all you need for a casual meal of cheesy potatoes and beef. This potato dish also revs up the interest in a meatloaf dinner and is a nice twist on the usual roast beef sides. In the summer this cold, cheesy potato dish makes for an interesting side to burgers. This potato dish is so versatile it also is tasty with chicken or fish entrees. Roasted, fried or broiled chicken and fried, broiled or baked flounder or sole are equally delicious partners. Chicken and fish are lighter than beef and let the cheesy potatoes take center stage. Serve hot or cold depending on the season and the main dish; if you serve it hot, don't use the lettuce leaves or eggs. Pair with the same green vegetables as you would if the potatoes were the main dish. This kind of dish and various accompaniments go great with beer, stout or lager. If you prefer wine, go for big reds like merlot, malbec and cabernet sauvignon with the beef meals, and dry whites like sauvignon blanc or chardonnay with the chicken and fish.